Manicotti (“muffs”) are large tubes of pasta, about 1 inch or so in diameter, which are traditionally stuffed with a mixture of cheese and spinach, topped with tomato sauce and cheese, and baked. 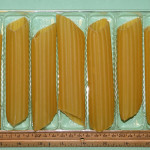 The dish can also be made with large shell pasta; or as Cannelloni, with flat sheets of pasta rolled around the stuffing. This dish can be prepared as a vegetarian dish, as written, or see below for options which include adding chicken or walnuts to the filling; or topping with a white sauce (Béchamel) over the tomato sauce before baking. Ricotta is a fresh cheese (not aged), made from whey. Ricotta is probably best known as the main ingredient in cheesecake. Milk contains two main protein fractions: casein (the ‘solid’ fraction that forms a curd and from which most cheese is made), and whey (the watery protein fraction). The dominant protein in whey is albumin. People with allergies to cheese might be able to tolerate ricotta, because it is not made from casein. Italian or Romano ricotta is usually made from the milk of sheep or water buffalo, but in the US, most ricotta is made from cow’s milk. The American version is more mild and bland than Romano ricotta, which has a nutty-sweet taste. If you cannot find Romano Ricotta, and want more flavor than the American version, replace some of the ricotta with crumbled feta, or grated Romano made from sheep’s milk. Or make your own ricotta using sheep or goat milk; its a great way to use up the whey that is a byproduct of most cheesemaking. 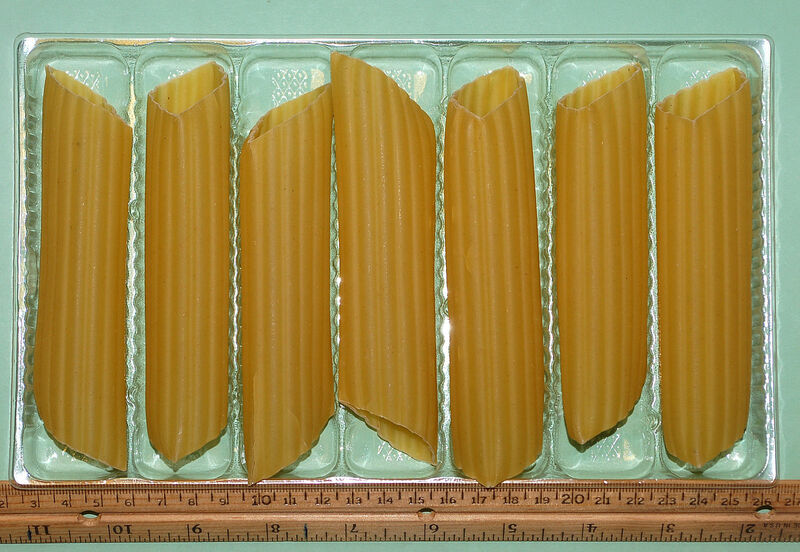 If you can’t find manicotti pasta, you can use cannelloni (similar to but larger than manicotti), extra large shell pasta (about the size of a toddler’s fist), or flat sheets of pasta (such as lasagna pasta that does’t have curly or fluted edges) rolled around the filling. When I’m in a hurry, I like to use the extra large shell pasta because you spoon the filling into the shell. If you use manicotti, you have to push it into the inside of the muff, which can be tricky unless you use a pastry tube. I make my own meatless rich tomato sauce (with sage or basil) for this dish, but you could use a meaty tomato sauce such as Bolognese. You could use a commercial tomato sauce but you may get ingredients you don’t want, such as GMOs. I’ve adapted this recipe from Food and Wine’s Three Cheese Manicotti recipe (1), and The Vegetarian Epicure, by Anna Thomas (2). As a vegetarian dish, this provides more protein (from the egg) than the related Spinach and Ricotta Pappardelle recipe, but I would still suggest serving another protein dish along with it, make the ‘chicken’ or ‘walnut’ options (below), or use a Bolognese sauce. This recipe serves 4 as is, or 8 as a side dish (but requires doubling the cheese). Casserole dish, Pyrex baking pan, or 4 individual gratin dishes. Prep: Prepare Tomato Sauce; keep warm. Preheat oven to 400°F. Butter or oil casserole dish (or substitute). Cook pasta in gently boiling water, uncovered, but stop cooking while still fairly stiff (it will continue to cook when baked). Filling: Pinch stems from each leaf of spinach; wash thoroughly in at least 3 changes of water; pat or spin dry. Then chop to about 1″ pieces. Set aside. Mince the shallot and garlic, and chop the parsley; set aside separately. Grate parmesan into bowl; set aside. Heat oil in saucier or deep skillet. Add shallots and cook over high heat until lightly browned, 2 – 3 minutes. Add garlic and spinach; cook, stirring (so garlic won’t scorch), until wilted (about a minute). Remove from heat. Beat eggs in a bowl; stir in parsley. Add ricotta, ¼ cup parmesan, nutmeg, salt and pepper, and mix well. Then stir in the wilted spinach mixture. Check seasoning. Using a spoon or pastry bag, fill each tube of manicotti (or the cup of each pasta shell) with the spinach/cheese stuffing. Arrange & Bake: Pour a third of the tomato sauce into the bottom of the baking dish(s). Arrange stuffed pasta over the sauce (if using individual gratin dishes, place 2 manicotti or 3 shells in each). If there is stuffing left over, either fill additional pasta, or just spoon the extra filling around the filled manicotti in the pan. Pour remaining tomato sauce over all; shake baking dish(s) a bit to get the sauce to settle through the stuffed pasta. Bake in preheated oven for 20 minutes; in the last 5 minutes, sprinkle with remaining ¼ cup parmesan and finish baking. Let sit for 5 – 10 minutes before serving. Add 1 cup cooked, chopped/shredded chicken breast meat, and use only 3 oz chopped spinach and 2 cups ricotta; prepare as directed. Add 1 cup coarsely chopped walnut meat (or pine nuts) to the filling, reducing the ricotta to 2 cups; prepare as directed. Instead of using ground nutmeg, heat 1 Tbsp whole caraway seeds in a dry pan over a medium flame to release their flavor. Stir them into the cheese mixture. Make a white sauce using 1 ½ Tbsp each butter and unbleached white flour, 1 cup milk or cream, and a bit of salt, pepper and fresh-ground nutmeg. After pouring tomato sauce over the stuffed pasta, pour the white sauce on top (I like to pour it in a wavy pattern so some of the tomato sauce is exposed). Bake as directed, adding the remaining parmesan during the last 5 minutes of baking. This entry was posted in Baked, Beef, Buffalo, Dairy, Eggs, Fat or oil, Herbs, Leafy Veggie, Nuts and seeds, Onion family, Pasta, Poultry, Spices, Vine veggies and tagged basil, cheese, egg, garlic, nutmeg, parsley, pasta, ricotta, sage, shallots, spinach, tomato. Bookmark the permalink.